If your little girl is ready to show her school spirit, then there may just be a place for her on the Rydell High cheerleader squad! Of course, she’s going to need this Grease Rydell High Cheerleader Costume if she wants to make the squad. Based on the outfit worn by Sandy and the cheerleaders in Grease, this licensed girl’s costume comes with everything that your little girl needs to get started. The knit sweater has a keyhole and button closure in back and a red chenille “R” applique on the front of the sweater. The matching red skirt has an elastic waistband and a side zipper for fitting. 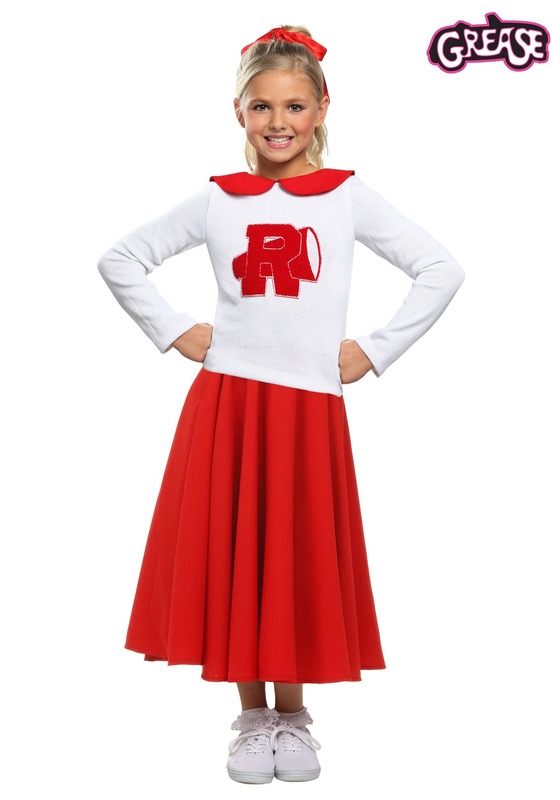 It’s the perfect outfit for turning your little girl into Sandy! After measuring my kids, and ordering based on that, these costumes were too small. The sweaters are very small but the skirts were fine. I have to be honest, When my daughter first said she wanted this costume, I just didn't get it. Even though, I am a huge fan of Grease. Anyway, when it arrived and she tried it on... well it looked perfect. She is def Sandy... except maybe we need some bangs ?? It fits her so nicely and she is over the moon. She is slim wears usually a size 10 but if a small 12 then she can use that as well. So, I chose 10/12 and it is absolutely perfect for her. I will say the 'sweater' could be a little longer, but we fixed that with a little layering. I am sooo pleased with her choice. Thank you so much Halloweencostumes.com.... I am always pleased with the quality of your costumes. Thanks for making Halloween fun every time ? ?